Heading to Spain this summer? If you love tapas bars and want to dabble in Sherry, but don’t know where to start, here is a cut out and keep guide to Sherry and tapas matching to help you get the most out of the experience. Sherry is an extreme wine – it ranges from extremely dry to extremely sweet. All dry Sherry will taste better with food, even if it is just an olive or a nut. The worst possible way to taste Sherry for the first time, especially if it’s a dry Sherry, is to serve it without something to snack alongside. The sweeter the Sherry, the easier to drink without food. All Fino and Manzanilla will match any salty dish. Fino and Manzanilla ought to be served chilled. If not, refuse it. With all other Sherries, it comes down to personal preference. I prefer mine chilled. I have listed the most common Sherry types and their pairings – Palo Cortado and Moscatel are less available. These are the Sherries of the DO Jerez. The DO Montilla Moriles is different. Boquerones/anchovies – in vinegar, fried or preserved/anchoas. Gambas/fresh prawns. All shellfish/mariscos. Olives. Fried fish. 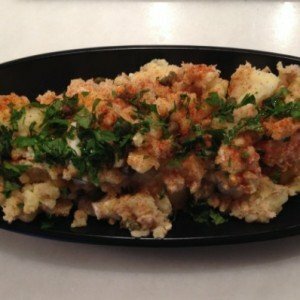 Ensaladilla. Nuts. Raw fish. Tomatoes. Gazpacho. Salmorejo. Fish in sauce/pescado en salsa. Roasted peppers with atun. Jamon. Queso. Nuts. Salads. Soups. Asparagus. Artichokes. Rice dishes with fish, vegetables and chicken. Quail. Chicken/pollo. Nuts. Tuna tartar. Albondigas. Burgers. Carrillada (cheeks). Lamb/cordero. Beef/carne. Pork/cerdo (secreto, presa etc) Jamon. Queso viejo. Nuts. Rabo de Toro. Oranges. Lemon tart. Cheesecakes. Fruit. Crème Catalan. Arroz con leche. Nut cakes. Dark chocolate. Blue cheese. Dates. Coffee. Or order a vanilla or chocolate ice cream/helado and pour your PX on top! Finally, always remember the rule of thumb with Sherry pairing: If it swims – Fino. If it flies – Amontillado. If it runs – Oloroso. If you like this, check out my beginner’s guide to Sherry. 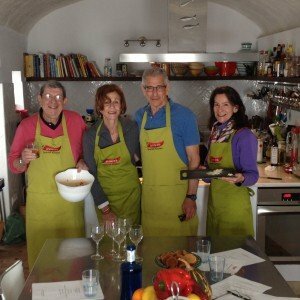 Or why not learn how to host your own Sherry and tapas party at home? 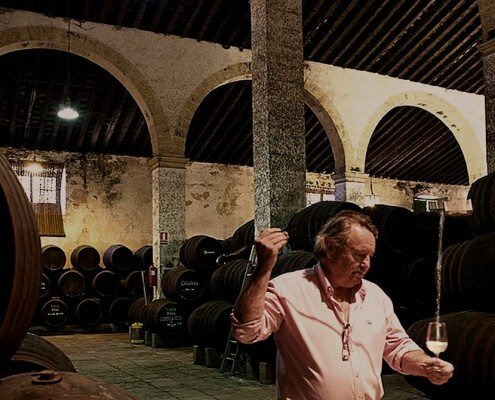 If you want to experience the wonders of Sherry at source, my 4 night Ultimate Sherry tour might be for you? Find out more.